When did you go to Clearwater Beach your first time? I went there for my first ever trainingcamp, I think it was in the spring of 1995. We wanted to watch an AVP tournament and the one that suited us best was the Clearwater Beach AVP tournament. We had no idea the beach was incredible and the training conditions were great. What are you looking forward to with BeachTravel´s trip to Clearwater Beach? I am looking forward to spend 2 weeks with others who share the same passion as me for beach volleyball and it will be great see the sun one last time before the long, grey and boring northern european winter. Do you have any tactical advice for BeachTravels´readers now when the competition season is here? First tip: Most tournaments are a lot of matches over one or two days and you need a lot of energy to succeed. Make sure you eat and drink as often as you can. My experience is that most players eat to few times and when they eat they eat too big meals. And most important, will the famous blue speedos go all the way to USA? 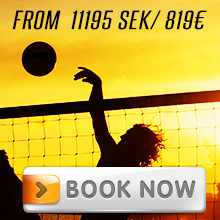 Sports Director @ The Beach with responsibility for all instructors, trained most of both men´s and woman´s swedish national teams, educates coaches for the Swedish Volleyball Association. The only swede (together with Hannes Brinkborg) to win an official international tournament (FIVB Satellite Casablanca 2006). 3 times Swedish Champion, winner of the Swedish Tour finale, 20 Swedish Tour stop wins, 55 World Tour competitions, qualified for the Main Draw at the World Tour.